“Pour” is not really the right verb, but it sounds so much more impressive than “Reviews trickle in.” Whatever the volume, I’m happy to report that Spinning in Place has garnered some reviews. Astonishingly enough, they are (mostly) from people I don’t even know. Even more astonishing, so far they are all very positive. Sweet little ebook on thoughts about the main pagan holidays, from a non-specific point of view. Anyone from a Wiccan to an atheist would probably enjoy it. Especially good if you’re new to the holidays. This is a thoughtful and thought-provoking essay. Many authors approach Wicca and Paganism as cookbooks of recipes for practice without ever presenting thought on the reasons to bother with it at all. Mr. Everson brings poetry and mystery to spiritual choices. This charming book is a personal travelogue of time and the holidays that are milestones throughout the year. Everson provides fascinating historical insights into holidays as well has his personal take on celebrating with his family. I keep the book around as a reference, but I happily read it start to finish. The world needs more celebration. This books points the way. Everson invites an open and fresh approach to ritual celebration. This will of course include the repetition of loved and familiar patterns, but not imprisonment within them. 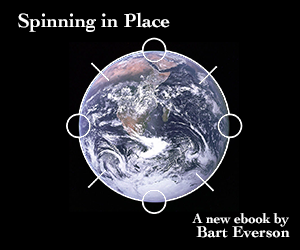 […] Spinning in Place shows how to create a wheel of the year which honours tradition, place and personal history. This approach allows fluidity and responsiveness to environment, community and culture both past and present. It clearly works for Bart Everson. Spinning in Place does not offer an off-the-peg set of rituals. Rather, it asks readers to wonder what we might do, in our place, using our histories and our forms of expression. That’s what makes it inspiring. Most astonishing of all: I am kind of stunned that people are actually reading my book. I keep pinching myself, but yes, it seems I am awake.